About A first year White Tail Deer resting by the shores of the river, curious about my approaching kayak, but not too afraid. Verry nice . Beautiful . Thanks Billy, Glad you like it! Thanks Bruce, glad you like the image of the little guy. Thanks for the nice comment Paul. with good contrast. A lovely view! 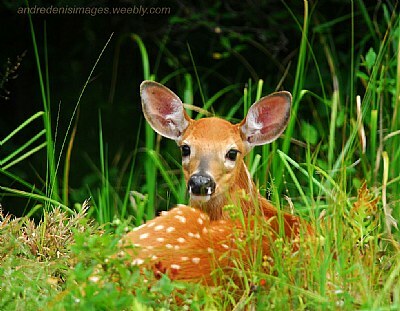 Yes, even if it is a kind of cliche "Bambi" type image, I knew there would be a lot of appeal. Who could resist? Andre, You have captured the beauty of this wonderful animal. He will learn fear of man this fall during hunting season. Thanks to the Staff for the recognition! Thanks for the visit and comment Gary! Thanks so much for the nice comment Jose. You have a great weekend too! Excellent shot of the deer in it's natural habitat. Probably wasn't too worried about you as long as you were in your kayak. Clear DOF, colors and beautiful composition.